Steel toe boots are the hard worker’s most favorite shoe. They’re strong, durable, and allow you to stay safe as you work. Not all steel toe boots are the same quality and we know that firsthand, so we decided to bring the best boots to you in one place. If you’re on the market for steel toe boots, we’ve got you covered. Choosing the best steel toe boots is quite the task. There are several things to consider before you invest in a new pair of boots that include the materials it’s made of and other qualities like insulation and water resistance. Here are a few qualities to look for in your next pair of steel toe boots. Material: In the steel toe boot industry, there are several types of materials used to make the shoes, but the most common material used is leather. Leather is durable and strong enough for even the toughest jobs. 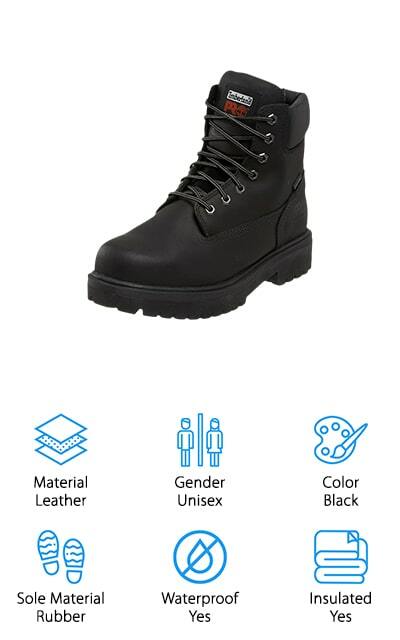 Gender: The gender of the boot determines the fit and style of the shoe. 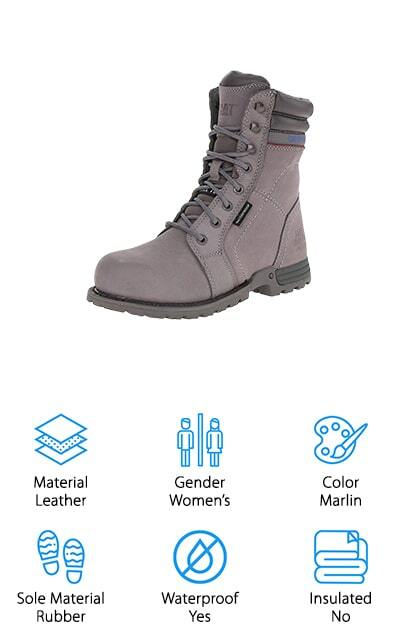 Some boots are unisex, but most have slight differences between men’s and women’s shoes. Don’t fall in love with a boot until you understand how it fits! Color: Like most shoes, there are several colors to choose from when you purchase a pair of steel toe boots. Most colors are neutral or dark colors to avoid showing dirt and spills. Choose the color that best suits you. Sole Material: Just like the boot material, there are several options for sole materials, too. Synthetic and rubber soles are the most common types of soles. They ensure that you stay upright and are easy to clean. Waterproof: Usually, people that need steel toe boots have the possibility to encounter water or other spills. Having waterproof boots can be helpful when you need to keep working through any weather or spill. 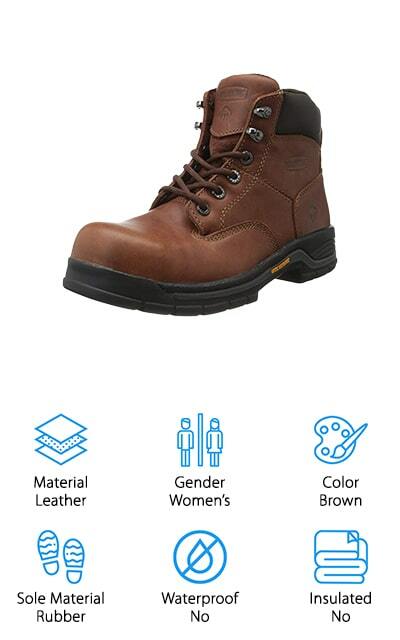 Insulated: Steel toe boots are perfect for you if you have to work in any type of condition. Insulated boots give you the most comfort during the hardest days of work. If you work in the cold or snow, insulation is key! If you’re ready to pick your next pair of steel toe boots, there’s only one thing to do: dive into the list! We’ve picked the top 10 best steel toe boots and laid out everything you need to know about them for you to make your best purchase yet. Our top pick and budget pick represent the two best pairs of boots on our list, but we’ve also included a few other pairs to ensure you find the perfect boots for you. Without further ado, it’s time to boot! The Caterpillar Echo Work Boot has everything you look for in a steel toe boot. 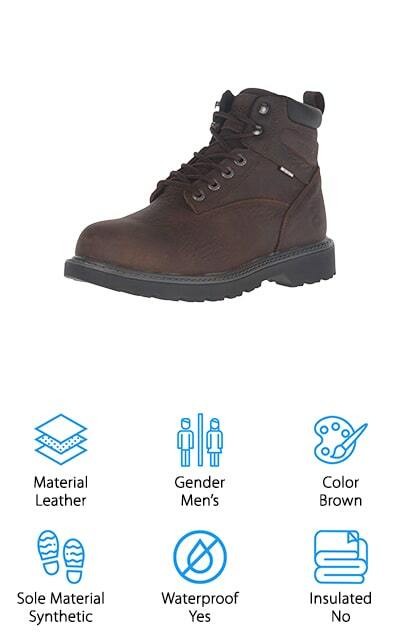 These leather boots are perfect for hard work in any weather. With waterproof capabilities, you’ll never have to worry about water getting into your shoes as you work. Caterpillar designed these shoes with their iTechnology to give these boots the durability they need for work while providing you the comfort of an athletic shoe. Inside, you’ll find a breathable lining that gives your feet room to breathe and a shock absorbing midsole. 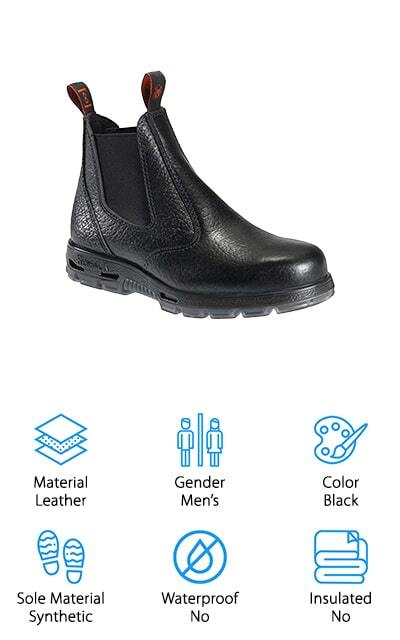 You’ll also be safe from harm as the Echo boots feature electrical hazard protection and slip-resistant properties, too. This non-traditional style boot is perfect for any woman who wants the protection of a steel toe boot and the look of a regular shoe. Caterpillar really outdid themselves with the Echo Work Boot. We give them two thumbs up and the title of best steel toe boots for women on our list. CONDOR’s Arizona Work Boot is a mix of work and military style boots. With 100% genuine leather upper, you can expect nothing less than superior durability. The steel toe on this boot is ATSM F 2413-11 Certified and can withstand most injury hazards in the workplace. 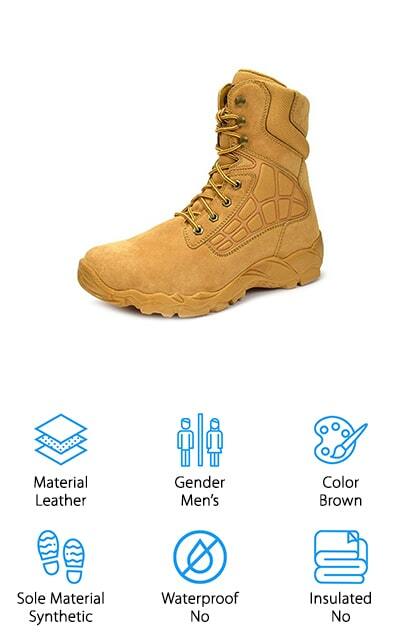 The outsole of these work boots is directly injected and bound to the upper part of the boot without the use of glue, making it the strongest bond between the upper part of the shoe and the sole. The PU midsole and insole provide you with extreme cushioning and support for long days on the job. The outsole is oil, slip, and abrasion resistant. These boots are considered wide width shoes so keep that in mind before you purchase. With three colors to choose from, you can match your boots to your uniform easily. For the best men's steel work boots, check out the CONDOR Arizona Work Boot! The Timberland PRO Direct Boot is the traditional style work boot you are looking for. Made from imported leather, you can expect a strong upper boot to save you from drops, spills, and falls. These boots come in five colors including your traditional colors wheat, yellow, and brown. The inside, upper portions of this boot are both waterproof and insulated to keep you from getting wet or cold while you work. The outsole is oil and slip resistant and will never mark the floor beneath you. The mesh linings near your feet are laced with antimicrobial properties to keep smells from hanging around after a long day with the boots on your feet. Timberland also incorporated a nylon shock diffusing plate to keep your foot rigid where you need it most. For the best waterproof steel toe boots, Timberland will be hard to beat. Grab yourself a pair of PRO Direct Boots and see for yourself! Dr. Martens Icon Steel Toe Boot will make a statement indeed! 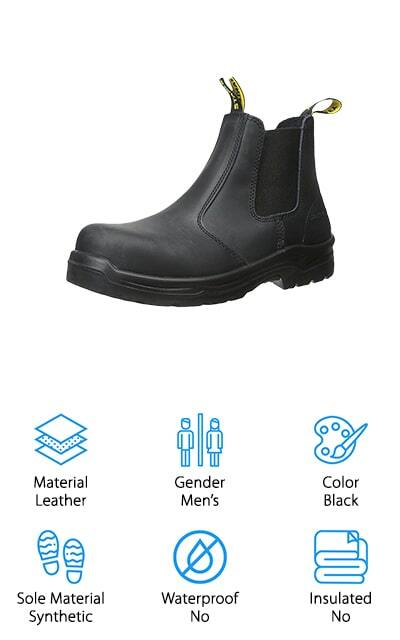 These tall steel toe boots are made from imported leather with a synthetic sole. On the outside, they’re durable and slip resistant. The protective steel toe inside the boot is ANSI-Rated to keep you safe at your work site. If something falls on your feet, your steel toe is rated to take it on without leaving injured. You won’t find any laces on these boots, just two tabs on either side of the boots to help you slip them on every day. These boots are also rated to keep you safe from electrical hazards on the job and other shocks you may face. With heat-sealed stitching, nothing will be able to find its way into your boot. For rugged reliability every day when work there’s nothing better than the Dr. Martens Icon Steel Toe Boot. Just be sure to check the sizing chart before you buy! Skechers Workshire Peril Boot gives you everything you love about a sneaker and a steel toe boot in one. These lace-up boots feature Skechers’s Relaxed Fit to give you more room where you need it. You’ll also find more memory foam and a better, more comfortable fit than other steel toe boots on the market. On the sides and heels of each boot, you’ll find leather overlays that help provide stability as you walk. You can remove the gel-infused footbed to see the shock absorbing midsole. The outsoles are durable and slip resistant under almost every condition. The steel safety toe meets several ASTM standards and certifications, ensuring you have maximum safety no matter what falls on top of your toes. If you’re on the prowl for the best-rated steel toe boots, look no further. If a trendy, comfortable steel toe boot that feels more like a sneaker is on your list, check out the Skechers Workshire Peril Boot! The Stanley Dredge Work Boot is made from 100% full grain leather with a synthetic sole to give you the durability and strength you need in a true work boot. These slip-on Chelsea-style boots allow you to hop out of bed and slip these boots on without any laces or straps. You’ll find that TPU toe caps and heel counters save you from injury time and time again as they create a barrier between you and your work materials. Inside, there’s moisture-wicking fabric to help keep the smells and sweat at bay while you work long hours. These boots were designed with safety trades in mind who expect excellent support, easy comfort, and lightweight duties. You can choose from two colors, black and brown, so you’ll have no problem matching your boots to your uniform. Stanley made it easy to choose the best slip on steel toe work boots. Grab a pair and see for yourself! Caterpillar’s Second Shift Work Boots are a heavy-duty steel toe boot for safety trade workers who work long hours every single day. The imported leather and rubber sole provide you with heavy duty boots that will last for years to come. This boot is known for its strength and flexibility as it gives you support where you need it and comfort, too. Caterpillar’s Climasphere insole was designed to keep your feet cool and fresh, no matter how many hours you’ve been on your feet. The steel toe is ASTM compliant for your utmost safety. The outsole is oil and slip resistant as worksites can get messy quickly. Caterpillar is known for their incredible boots that are genuine and hardworking shoes. You’ll have a hard time finding a better pair of steel toe boots. 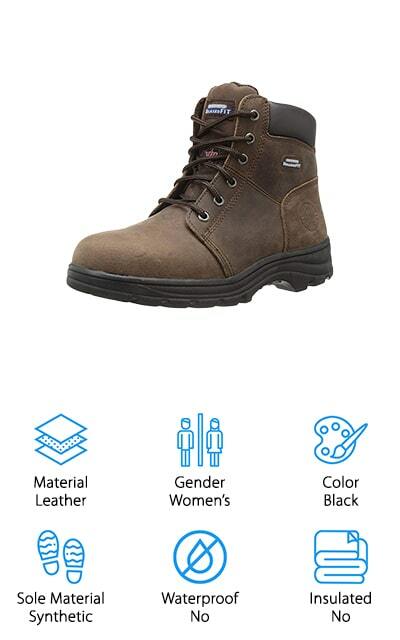 For the hard worker in your life, the Caterpillar Second Shift Work Boot makes a great gift! Redback’s Easy Escape Work Boots are truly easy to escape! These slip-on boots are made from leather and TPU soles. The outsoles are oil, heat, and slip resistant, making them some of the most durable boots on our list. The steel safety caps in the toes meet and exceed ASTM standards to ensure your toes will stay safe in almost any common work accident. These boots are the number one best-selling steel toe boots in Australia because of the original rambler style boot and leather. These boots are also 100% Australian made and are sized in Australian and United Kingdom shoe sizes. Be sure to check the sizing chart before ordering if you live in the US. These boots are known for extreme comfort as they take the shape of regular rambler boots and offer the strength of steel toes. Redback boots are considered the best lightweight steel toe boots for many and we love them, too! The Wolverine Harrison Safety Boot is considered to be some of the most handsome and rugged steel toe boots. With oiled materials, this boot is considered to be much lighter than your standard steel toe shoe. The ASTM compliant steel toe is also non-conducive in case you come across electrical hazards at the work site. Inside you’ll find a removable cushioned footbed that can be cleaned after long days at work. The breathable internal linings allow your feet to breathe while fighting sweat. Wolverine boots were originally created to withstand the toughest environments and their brand still holds true for their Harrison Safety Boot. With patented shock absorbing technology, you’ll be able to withstand common trips, falls, and accidents on the job. For the best-rated steel toe work boots, Wolverine never lets you down. Check out the Harrison Safety Boot for comfortable, lightweight steel toe boots for a great value price! Last but not least is another pair of Wolverine boots. This traditional style steel toe boot offers full-grain waterproof leather and an outsole made for traction in any environment. The removable footbed provides you with comfortable padding to keep you on your feet longer. These boots are often used by workers who find themselves out in different climates throughout their shift. From snow to water, these boots work well to keep your feet dry and warm. The steel toes inside the boots are ASTM certified for several different standards to ensure your feet are protected from common workplace accidents such as trips, falls, or slips. These shoes are also rated for electrical hazards, too. These Wolverine Steel Toe Work Boots are truly versatile for any kind of work or weather. With dark brown and wheat colors to choose from, these boots will fit right in with any uniform. For the very best steel toe boots, never count Wolverine out of the race!